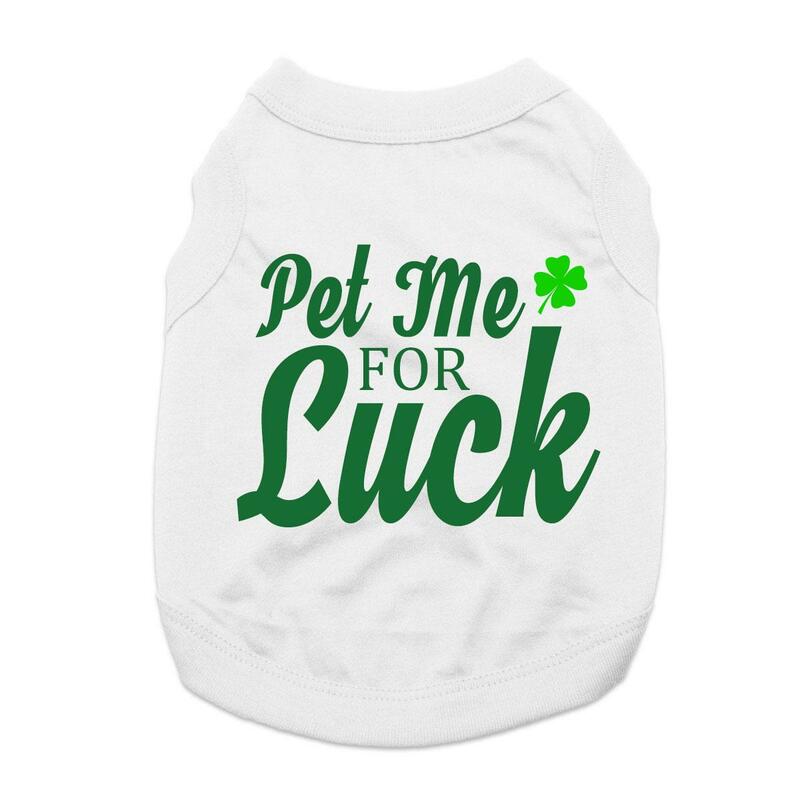 This St. Patrick's Day your dog is sure to get some extra attention and love in the Pet Me for Luck Dog Shirt in White! 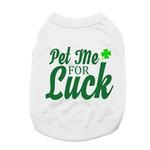 The Pet Me for Luck Dog Shirt will make this St. Patrick's Day memorable and fun! This dog tank top features a sleeveless style with a high-cut, stay-dry belly for the ultimate comfort and convenience. This exclusive design is printed right here in our BaxterBoo.com T-shirt Shop for your dog and is available in a wide range of sizes to outfit the whole pack! The 100% cotton is breathable and comfortable. Machine wash cold and dry flat for best results. Great for a gift! 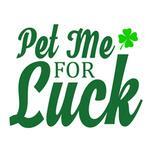 Pet Me for Luck Dog Shirt - White Customer Photos - Send us your photo! Happy St Patrick’s Day! Lola is wearing her Pet Me For Luck dog shirt today to celebrate the day! Thank you BaxterBoo for having something for every single holiday..so much fun choosing and Lola is always the perfect model, no matter what day it is! The material is thin and is see thru and a dirty white - not bright as in picture and the color of the font is dull faded green not bright pretty as in pic. Posted On 03/19/17 by Laura D from Crestwood, KY Yes, Laura D recommends this product! Received lots of pets in this shirt. Only complaint would be the lettering color was lighter than I expected. Posted On 03/17/17 by Amanda M from Hicksville, NY Yes, Amanda M recommends this product! This shirt is cute, its not heavy at all because of course we dont know what the weather will be like and i wouldnt want my pooch sweating. I got an extra large (my dog is usually a large) but i dont like when the arm holes are too tight. Posted On 03/14/17 by Brenda V from Thomasville, GA Yes, Brenda V recommends this product! This tee is perfect for St. Patty's Day! Posted On 02/20/17 by laura m from shreveport, LA Yes, laura m recommends this product!